"The Artist" is so utterly charming in every way that you'll want to be the first to tell all of your friends to seek it out and see it immediately. It's that good. Don't worry that recommending a black-and-white, non-widescreen, symphonic-score silent movie may be a tough sell to some of your less open-minded associates. Anyone who buys a ticket thinking the movie may turn out to be inaccessibly arty or boringly old hat will be that much more impressed when they realize how completely wrong they were. This sweetly retro romance by director/writer Michel Hazanavicius is an everything-old-is-new-again treat. Cheerfully hammy silent film star George Valentin (Jean Dujardin) is riding high in 1927. We first see him making a personal appearance at his latest Hollywood premiere with his constant onscreen and offscreen companion: a nameless but ridiculously expressive Jack Russell terrier. Outside the theater, George encounters adorable and extroverted fan Peppy Miller (Bérénice Bejo), who is such a hit with photographers that she shows up under a "Who's That Girl?" headline in the next day's Variety. Turns out Peppy has acting aspirations of her own, and lands a small role as an extra in George's next movie. The two are supposed to dance together only briefly before moving on to other partners during filming, but their playful attraction grows deeper with each take. Like countless other occasions in "The Artist," the scene cleverly shows how those kinds of magic moments can work perfectly well without words. Another endearing pantomime occurs when Peppy sneaks into George's empty dressing room. Finding his tuxedo hanging on a hat stand, she interacts with it as if it is George. When she puts an arm through a sleeve and pretends it is his hand that's caressing her, the illusion is wistfully and irresistibly romantic. The attractive actors have genuine onscreen chemistry, and it's easy to see why their thoroughly likable characters would fall for each other. Unfortunately, George has a bored wife back home at his mansion who enjoys blacking out movie stars' teeth in magazines. Other complications arise when George is fired by studio head Al Zimmer (John Goodman) with the arrival of "talkies" because his unheard voice is unacceptable for films with sound. Peppy has no such problems, and her career soars as George's nosedives. Dujardin won the Best Actor prize at Cannes for his flawless portrayal of George, whose happy-go-lucky confidence, self-destructive pride and bitter resignation are equally believable. And like George, audiences will find it impossible not to fall in love with Bejo's thoroughly adorable, heart-of-gold Peppy. The miracle of this movie is the way it makes a classic "a star is born" plot seem fresh without resorting to anything resembling irony. 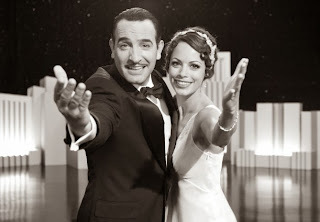 Joyous, uplifting and touching, "The Artist" is as elegantly simple as it is sincere. "The Artist" and "Melancholia" are the only films this year that I have given A+ ratings, and the two could not be more different. While "Melancholia" is challenging, strange and disturbing, "The Artist" is so universally appealing that I can't imagine anyone disliking it. Director/writer Hazanavicius and both stars should receive awards for this remarkably special achievement. If "The Artist" is nominated for a Best Picture Oscar, it will be the first silent movie to be among the finalists since 1928's "The Patriot." It deserves the honor, and it deserves to win.